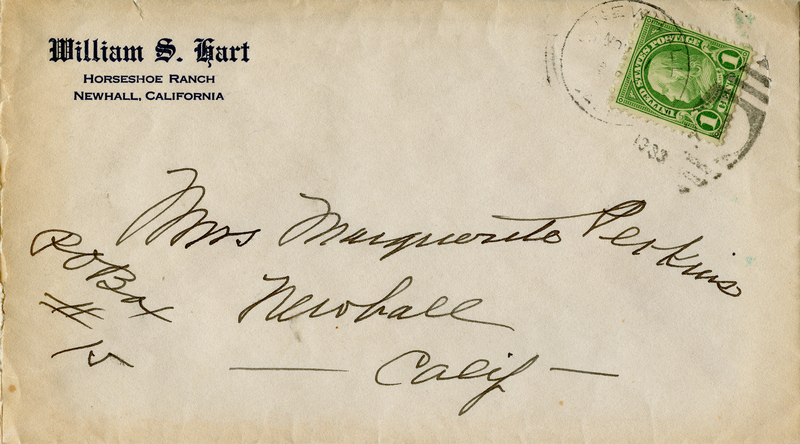 Personal letter from William S. Hart (Horseshoe Ranch, Newhall, California) to Mrs. Marguerite Perkins (P.O. Box 15, Newhall, Calif.), dated Nov. 1, 1933. Postmarked Newhall. Paper: 8½x11-inch parchment, with watermark (National Bank Bond / A Butler Paper). HS3301a: 9600 dpi jpeg from original envelope | SCVHS Collection.